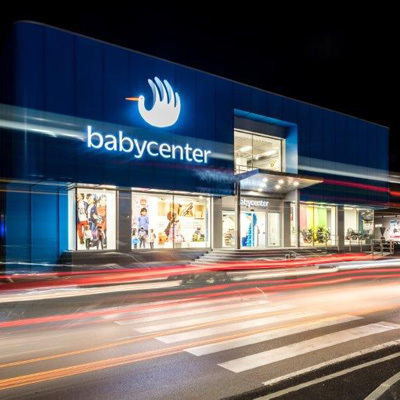 Baby Center opens its redesigned largest and most modern store to date • BTC d.d. For 25 years, Baby Center has linked the playful world of children with the world as seen by their parents. A quarter of a century of customer loyalty motivates them to become even better. As the times change, so do they. Yet their support of children and parents alike remains constant. “Beginnings aren’t easy, but they’re equally important for parents and children. We at Baby Center welcome these beginnings, because we know that we grow with them and learn. Being a parent means following a path full of surprises, unexpected happiness, hard effort, and joy. Although the path can be difficult, most of the time it’s the most beautiful one imaginable. Still, you could always use a helping hand and an honest smile, because you can’t do everything by yourself. We are that hand, steering you along, guiding you, and offering you comfort. We are here for all parents, babies, toddlers, children, and beginnings,” they say. “Baby Center, a helping hand for all beginnings,” is the new motto of Baby Center, a result of its collaboration with the Brandoctor agency, which also designed the new look of the brand and the store itself. The redesigned logo and other unique visuals derive from the hand – a hand that can fly, jump, crawl, and has no limits in a child’s imagination. The famous stork, which has also been upgraded, has been joined by a giraffe, a flamingo, an elephant, and a dinosaur, all of which together form a fun family of exotic animals and give Baby Center a distinguishing mark. With this approach, they specifically address their youngest visitors, but also those a little bit older who keep in touch with their inner child. Their new story begins with a completely redesigned playful look of their biggest Baby Center store in BTC City Ljubljana. This store, which spans a surface of about 2,300 m2 in Hall 11 of Ljubljana’s BTC City shopping centre, is now not only the largest, but also the most modern store with the most comprehensive selection of products for mothers and children in Slovenia. It covers three stories, offering a wide selection of clothing and footwear for all occasions, including the new Cool Club and Kanz brands, the most comprehensive and diverse selection of toys, baby food and products, as well as various other utensils and accessories for toddlers, pregnant ladies, and mothers. The upper floor houses a redesigned, unique section offering a wide selection of internationally recognised baby stroller and car seat brands for toddlers of all ages. You can also choose among a variety of high-quality, practical, and gorgeous furniture items and accessories for children’s rooms. The Ljubljana BTC City branch is designed to give comfortable access to all areas to pregnant women and parents with strollers. It also has baby nursing and changing rooms, as well as a designated “rest area” on the ground floor, possibly most frequented by fathers, which includes an internet corner, where you can check out the products on offer in our online store. Baby Center now also offers its customers free internet access. “With the Baby Center redesign we wanted to go one step further. We are well aware of the importance of the Baby Center brand, which we have been developing for 25 years. A lot of effort, time, knowledge, and good wishes have gone into alleviating the difficulties and brightening the days of moms, dads, and toddlers everywhere, as we all get to know each other, learn, and grow,” said Matjaž Marinšek, director of the Baby Center d.o.o Company. Not only do we want to ensure the kids a happy and playful childhood, we are also well aware of the importance of the quality, safety, and educational value of the products on offer in our stores,” he adds. “This has truly been a year of milestones for us. In addition to opening the most modern and family-friendly store in Slovenia, we are also celebrating the 25th anniversary of the Baby Center Company and brand. I would like to use this opportunity to thank all our business partners, who have helped us shape this success story, and of course all our staff, who come to work with incredible sensitivity and joy, offering great advice to moms, grandmas, dads, and their friends,” said Marjan Bevk, owner of the Baby Center d.o.o Company. “With its products and services, our company helps parents and supports them each step of the way on the incredibly important journey they are undertaking. We believe that our stores reflect the values represented by the Baby Center brand,” he adds. The redesigned store in Hall 11 is open from Monday to Saturday between 9 a.m. and 9 p.m., and now also on Sundays and holidays between 9 a.m. and 3 p.m.